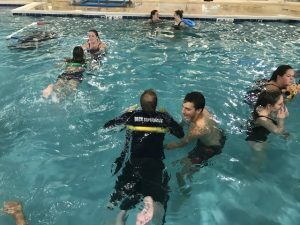 Our goal for our swim program is to teach water safety and instill in all students a true love for the water. In fact we want our campers to love it so much they could live in the water. To achieve this our goal is that all swimmers feel safe, balanced, comfortable, and happy in the water. 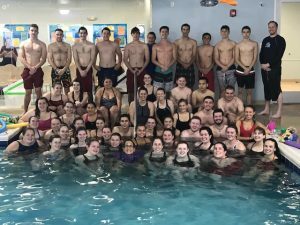 This is how swimming and a love of water becomes a skill for life! Recognition and Awards: Campers and their parents will receive continued feedback on their progress through our new ribbon rewards. As campers achieves a new goal/skill they will receive a ribbon recognizing this achievement. Collect them and watch your child’s confidence and pride soar. 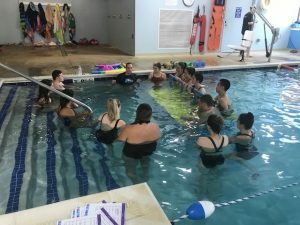 Staff Training: Just a few weeks ago we had the opportunity to bring all of ourswim instructors to the Little FlippersSwim school facility in Winchester, to learn from Andy and other Little Flippers leadership team members. 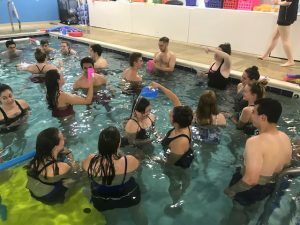 Staff were in the the water practicing with each other and are ready for a summer in our beautiful lake with our campers!